Hello everyone! I am so happy to be guest designing for The Stamps of Life this month. For those of you that don't know, it was because of The Stamps of Life that I first got into card making a few years ago. I had stumbled across their gorgeous Candles4birthday Stamp Set while looking for ideas for my sister-in-law's first baby shower. I had never even seen a set of clear stamps prior to that and from that moment on, I was hooked! 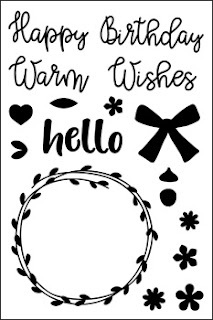 I have a fun card to share with you today featuring the new and gorgeous wreath2stamp set. I absolutely love this wreath! This set is just so beautiful and versatile. To start, I first stamped this wreath twice in two separate colors. Once with Color Box Blue Jay Ink and the second wreath with Color Box Seaglass Ink. I then used the coordinating die set to cut them out. I then used a sheet of Gingersnap Card Stock and trimmed it to 5.5" x 3.75". I used a Circle Die to cut a hole in the top center of the card and then added a piece of fencing into the center of the circle from the Sizzix Flowers & Fence Stamps & Dies. I adhered this entire panel to a sheet of patterned paper from the Big Hugs Patterned Paper Pad. I then colored some birds from the Birdcage2stamp Set with Copic Markers (BG0000, BG000, BG11, BG45, BG18). I used the coordinating dies to cut them out. For my sentiment, I cut a strip of Powdered Sugar Card Stock and stamped my sentiment with Seaglass Ink. I added my wreaths in separate layers. I glued the lighter one to the outer edge of the circle window on my card panel. I then added a few leaves that I cut using the Wreath2stamp Die Set from both Blue Jay and Seaglass Card Stock and added my top wreath with some 3D Foam Adhesive to give it more dimension. I then diecut some white flowers using the same wreath die set and used some more foam adhesive squares to add them to my top wreath. To finish my card, I then added a drop of Sea Breeze Nuvo Jewel Drops to the center of each flower. I hope you enjoyed my card today! You can check out the rest of the beautiful stamps and dies offered from The Stamps of Life HERE. Thank you for stopping by! If you liked this card and want some more crafty inspiration, don't forget to check out my INSTAGRAM feed! Well, I'm so happy you found out about cardmaking as you are so talented! This card is just delightful. I like the blues against the kraft. Such a sweet little scene. Thanks for sharing! Seeing your cards make my day. You truly are a talent all onto your own; light years ahead! Thank you for sharing your talent.